Given the vast amount of cars on the road at any given time across the UK, it is unsurprising that accidents regularly occur. Yet their relative frequency doesn’t negate their seriousness - the injuries and damage that may be caused by an accident on a road or other public place can be particularly severe. It is certainly right, therefore, that victims of road traffic accidents or the families of those who die on the road receive compensation. As with other types of personal injury, the law in Scotland seeks to protect victims of road traffic accidents that are caused by another person. When an injury is sustained in a road or car accident, and it is caused by the negligence of someone else, the victim is entitled to claim compensation. Unfortunately, these seemingly straight forward basic legal principles of negligence can be difficult to apply in road traffic accident cases, particularly when it comes to establishing liability. Professional legal advice is necessary for all types road traffic matters, from recovering loss from an uninsured or untraced driver to receiving compensation for a catastrophic injury. Our specialist personal injury lawyers have a deep understanding of the law and the process for establishing liability and claiming compensation following a road traffic accident. This means they are best placed to uphold their clients’rights when dealing with insurers or an insurer’s claim handling company, or securing compensation from the Motor Insurance Bureau if their client is a victim of a hit and run or an accident caused by an uninsured driver. Have you been injured in an accident that wasn't your fault? Call us now. Road traffic accidents occur on a public road or carriageway where vehicles and the public have access. They usually involve a collision between road users and cause injury to one or more individuals, such as a driver, passenger, motorcyclist, cyclist, horse rider or pedestrian. An accident can occur whether these individuals are stationary or on the move. All of these multiple variables highlight the many different circumstances that can lead to a road traffic accident. In Scotland, most road traffic accident claims for compensation are brought under the law of negligence. This means that personal injury suffered in a road or car accident must be the result of the negligent act or omission of another. Once liability for the accident is established, the injured person is entitled to compensation for loss and damage from the wrongdoer. In order to establish liability, it is necessary to show that the person caused the accident because they breached the legal duty of care they owe to other road users. This duty places a responsibility on all road users to drive with the ordinary skill and care of a reasonably competent driver. The courts assess whether the duty has been breached by applying an objective standard. It is therefore irrelevant how much experience the driver has. Whether they are a learner driver or have clocked hundreds of thousands of miles, both are expected to drive with the same standard of care. If a driver falls below a reasonably competent standard and causes an accident, they are liable for any injury caused. They may also have committed a criminal offence. In some cases, it may be necessary to prove that the accident caused the personal injury that compensation is being sought for. The legal term for this is causation, and should a claim go to court, the parties to the action may need to submit evidence about what caused the injury. In some cases, this may mean that the injured person will need to be seen by a medical expert. 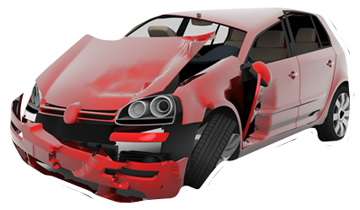 Expert road traffic accident lawyers can advice their clients about whether this might be the case, and direct them to suitable and reliable healthcare professionals. Road traffic accidents involving motorists where they are likely to breach their duty of care and be liable for a compensation claim include: attempting to overtake when it isn’t safe; going into the back of a vehicle that brakes suddenly; speeding; jumping a queue; failure to adhere to roundabout rules. Road traffic accidents involving cyclists where a road user’s duty of care is likely to be breached include: a motorist overtaking a cyclist without leaving them enough room for movement; causing a cyclist to collide with a car door by opening it without warning. Road traffic accidents involving motorcyclists where the motorcyclist’s duty of care is likely to be breached include: speeding; riding without enough stopping distance or without a helmet. Debris or lack of road maintenance - injury may also result because of debris on the road or because the road itself is in bad condition, in which case the public authority responsible for maintaining the road may have broken their duty of care to the public and be liable for a compensation claim. If you have suffered an injury in any of these types of situation, or similar situations, you are likely to be entitled to compensation. keep a record of any expenses or loss of earnings, such as wage slips for before the accident and those after that reflect time you have had to take off work. Evidence is vital for road traffic accident claims, particularly when liability is disputed. Our expert road traffic accident solicitors take care of every aspect of a personal injury claim following a road accident. Not only can they help you gather the relevant information, but they can also advise on receiving specialist medical treatment and getting car repairs. Find out how much you can claim for personal injury in Scotland here.